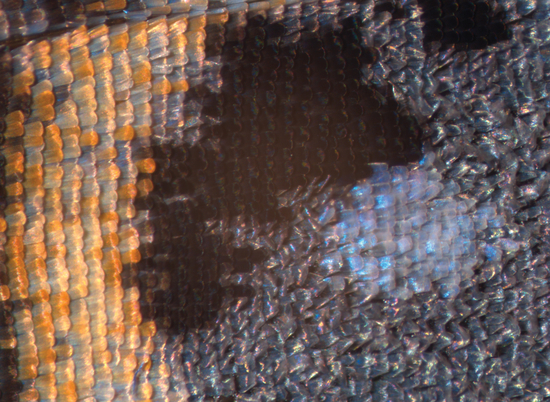 Close-up view of a wild-type Junonia coenia wing eyespot pattern. Photograph by Arnaud Martin. In the life of a butterfly, color is crucial. Color helps these flashy insects attract mates, avoid being spotted, or even signal to predators that they would make a bad meal. On the cover of the March issue of GENETICS is a close-up view of Junonia coenia, a butterfly with stunning blue eyespots on its wings. This species, along with three other types of butterflies, was the subject of research by Zhang et al. into the ways butterfly wings get their eye-catching hues. In Junonia coenia, mutations in pale result in these barely-colored eyespots by affecting the black pigment beneath the blue scales, which normally absorbs excess light and intensifies the blue color. Photograph by Arnaud Martin. The goals of the study were to find and characterize genes that might play a role in wing color development, to determine whether previously described genes that affect color in other insects and unknown candidate genes play roles in butterfly wing coloration, and to figure out the mechanisms behind these genes’ effects on wing color. As well as providing insight into the complex ways butterflies generate their colors, studying pigmentation in butterflies has the unique benefit of an easy readout of a gene’s effect, since the wing patterns can be seen by eye and enhanced by low-magnification microscopes. In search of genes that contribute to pigmentation, the researchers looked for genes that significantly changed expression in the wings during development, indicating that they might play a role in color formation. To pare down this starting list of over 2,000 genes, they applied stringent screening criteria that narrowed their focus onto just 53. 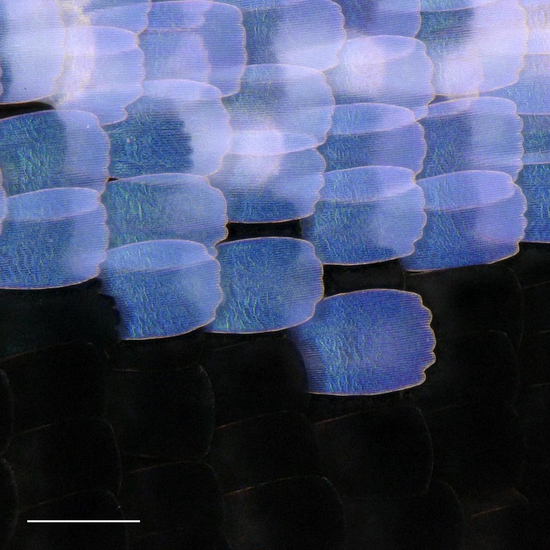 Close-up of scales in the wing eyespot focus of the wild-type Junonia coenia. Photograph by Arnaud Martin. Many of the genes they found to affect coloring in butterfly wings are also known to contribute to coloring in other insects, and in many cases, the mechanism behind the genes’ effects on color seemed similar between butterflies and other insects. One of the genes they investigated, called pale, is associated with a light-colored phenotype in flies. Mutating pale caused marked defects in pigmentation in the butterflies’ wings, making their normally vibrant-blue eyespot patterns seem dull. But interestingly, the blue scales themselves were intact—it was the loss of the matte black background, which normally absorbs excess light of other wavelengths, that resulted in the loss of blueness. That the black background is important is consistent with some recent biophysical research on color formation in butterfly wings. This finding also highlights the importance of increasing the number of model organisms we study for gaining insight into the functions of genes—which, with the advent of CRISPR/Cas9 genome editing, is now a much more feasible goal. 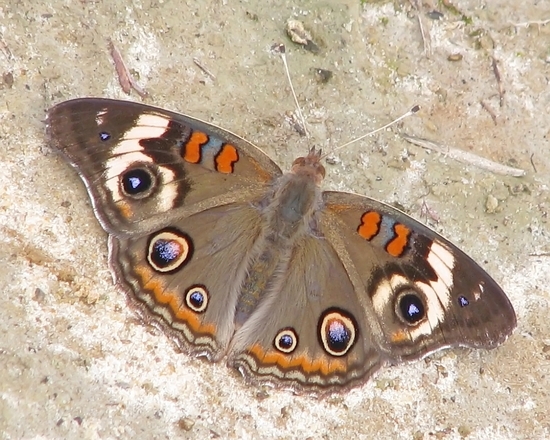 Wild-type Junonia coenia. By Vicki DeLoach via Flickr. 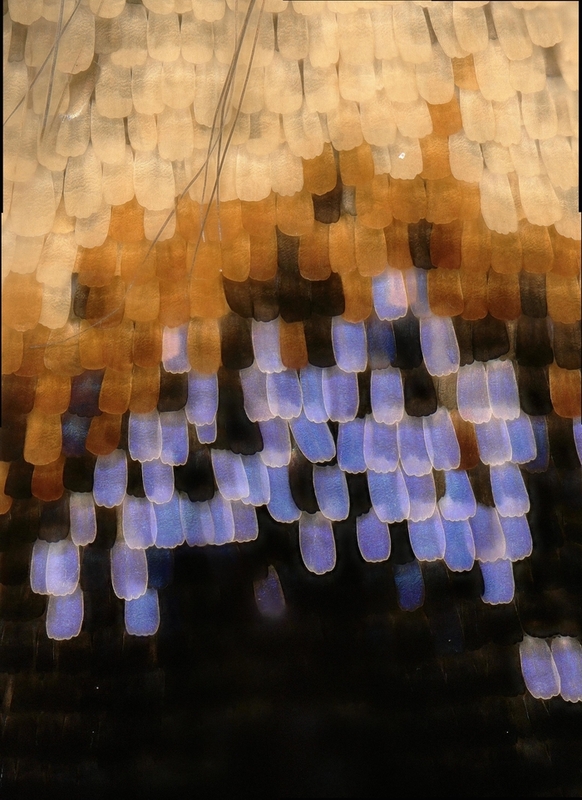 Zhang, L.; Martin, M.; Perry, M.; van der Burg, K.; Matsuoka, Y.; Monteiro, A.; Reed, R. Genetic Basis of Melanin Pigmentation in Butterfly Wings.